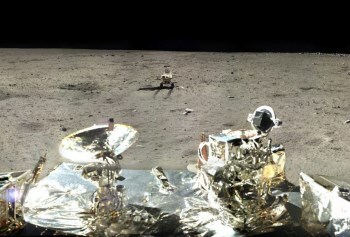 China's Jade Rabbit moon rover is awake and talking, but it's not out of the woods just yet. China's moon rover suffered a rather famous mechanical failure in January, just over a month after its December 14 landing. The failure of the probe, named Yutu - Jade Rabbit in English - in and of itself wasn't what attracted the attention, however, but rather a first-person account of the breakdown on Sina Weibo, the Chinese equivalent of Twitter, which ended with, "I'll tell everyone a little secret. I'm actually not that sad. I'm just in my own adventure story, and like any protagonist, I encountered a bit of a problem. Goodnight, Earth. Goodnight, humans." Jade Rabbit wasn't expected to survive the two-week-long lunar night that followed because of a solar panel that failed to retract, leaving it exposed to extreme cold, and Chinese news site ECNS did in fact report yesterday that the probe was lost. Today, however, a spokesman for China's lunar program said that contact had been restored and that it was now "fully awake." "Jade Rabbit has fully resurrected and is able to receive signals, but still suffers a mechanical control abnormality," Pei Zhaoyu told Xinhua. "The rover entered hibernation while in an abnormal state. We were worried it wouldn't be able to make it through the extreme cold of the lunar night. But it came back alive. The rover stands a chance of being saved as it is still alive." The China Space Facebook page confirmed that the rover is suffering from the same technical problem that plagued it before the hibernation and said mission control is working on trying to get it fixed, but also sought to temper expectations. "Even though there are positive signs, don't get your hopes too high though," the agency wrote. "Yutu is not going to be as functional as before. The real end may not be far." Be that as it may, it's great to see that the mission isn't over yet. And right on schedule, the Jade Rabbit Weibo account came back to life, too. "Hi, anybody there?" it said in its first message since going into dormancy. Within minutes, thousands of people had replied.